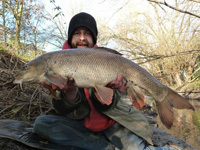 The Year Of The Barbel... It's all over for another season, a season that was a real slave to the weather, but looking back there was some brilliant fishing. River piking was a wash-out, three pike from Penton Hook, a couple of jacks from Bury Hill, no Chew Valley tickets, a frozen Blenheim Palace and a flooded out River Wye. It's a real shame I didn't wet a line in The Wye all season - and I love fishing this river. It's a lesson learned; I'll be starting my hunt for pike a lot earlier next season. 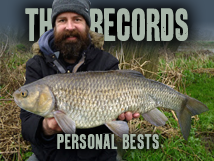 We caught a lot of species of fish this season, I had a new PB river carp, Dan upped his chub PB and caught a monster bream - his first. But it was the barbel that made the season, both Dan and Darren landing a double, and I'm very pleased to say so did I, my first barbel over the magic ten pound mark. June: After a closed season that seemed to last an eternity, I was on the riverbank to see in the new season - and that morning I had the bite I'd dreamed of for three months. 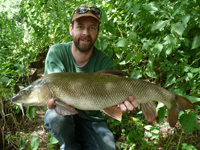 The first barbel of the season was on the bank. 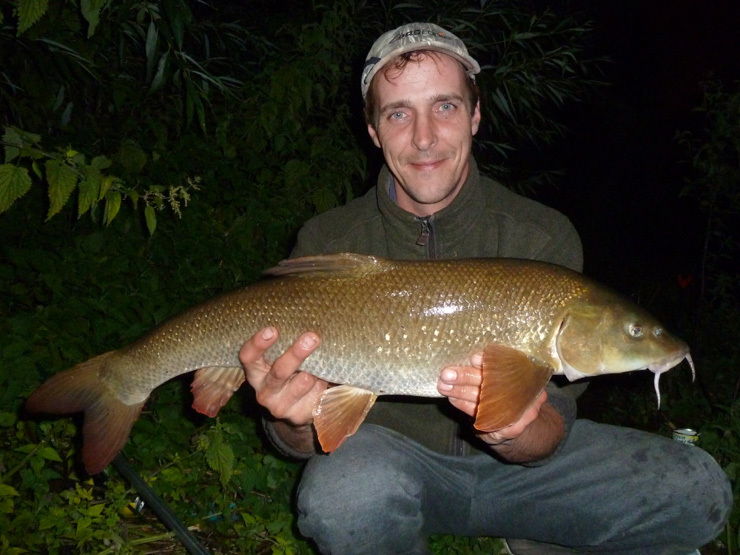 Dan and Darren were soon into the barbel, and Roger's first barbel of the season was a Wye double. On the last day of the month I finally joined the double club with a 10lb 6oz barbel, I was ecstatic - I'd been chasing one for a very long time. Even though I upped my PB three more times thoughout the year, this was the fish of the season for me. July: It was hot! 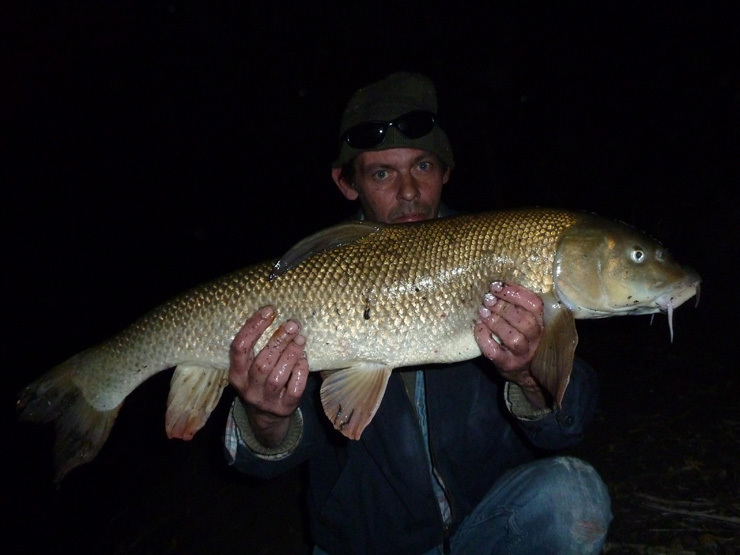 At the start of the month we cracked into the barbel, Darren taking a couple of nine pounders, and we all caught a 6lb+ fish in one short evening session, our new bait, SB4, really proving itself. But as the month went on, and the temperatures rose we really began to struggle to find fish - the honeymoon was over, they had wised up to us fishermen! August: Myself and Darren started our river carp quest, stalking fish in the shallow water, Darren setting the standard with a 9lb leney carp - which I soon upped to a 14lb 7oz mirror carp - a new river PB. 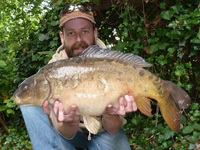 We had a few more, Darren catching another leney carp - a sub-species I've never caught - next year? 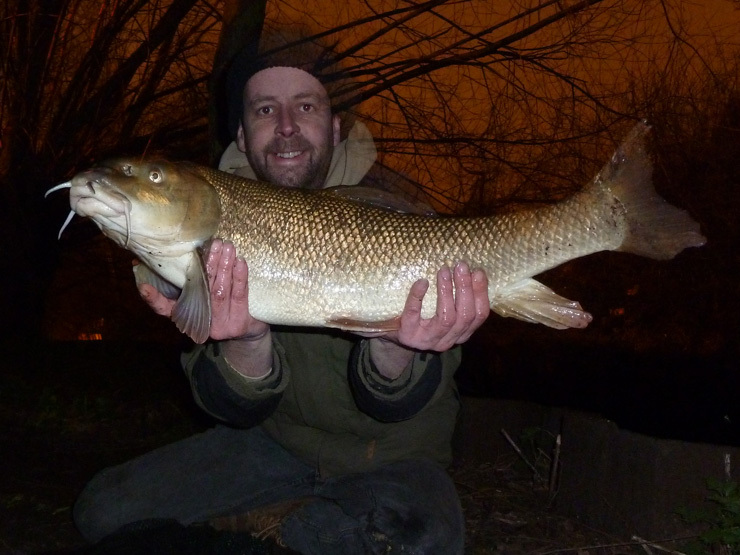 Turning back to barbel I upped my PB with a 10lb 8oz fish, before disaster, another pollution incident. We feared the worst but a rain storm helped dilute the pollution and wash it out of the river. 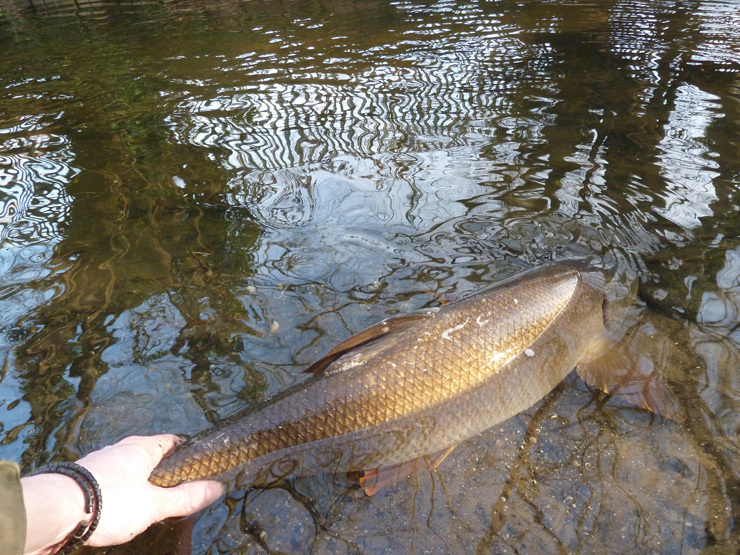 The barbel came back on the feed, and I had my best session of the year, five barbel and a chub in 4 hours! September: We all caught a double - the same one! But Dan had upped his PB to 10lb 6oz. Half way through the month there was a real chill in the air, a sign of things to come. Time for our first trip to Penton Hook, and for the only time this season the water looked perfect for pike... And we didn't catch one! 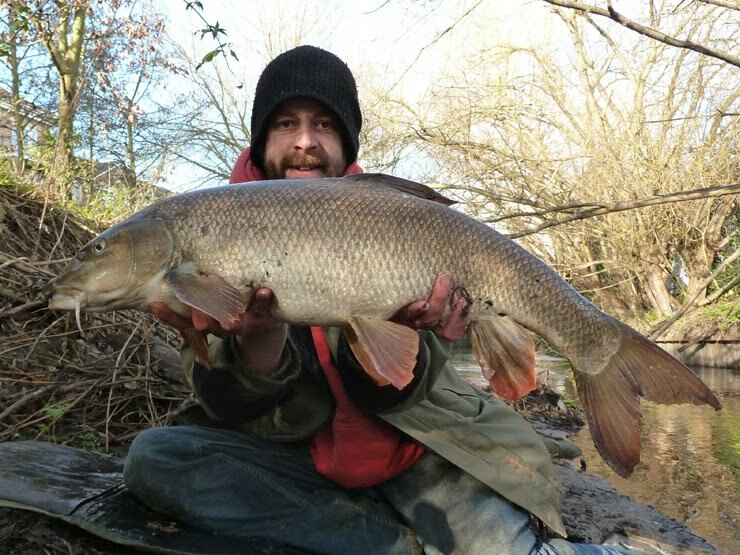 The barbel fishing had slowed right down - so I came up with the idea of trying to catch a 5lb+ every calendar month of the season - something that was to mean I was to spend a lot of time on the freezing riverbank over the winter. 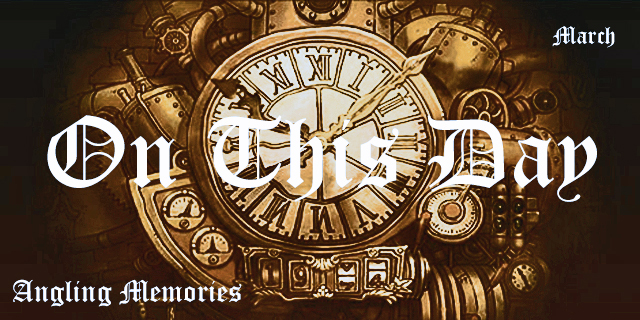 A lot of time! 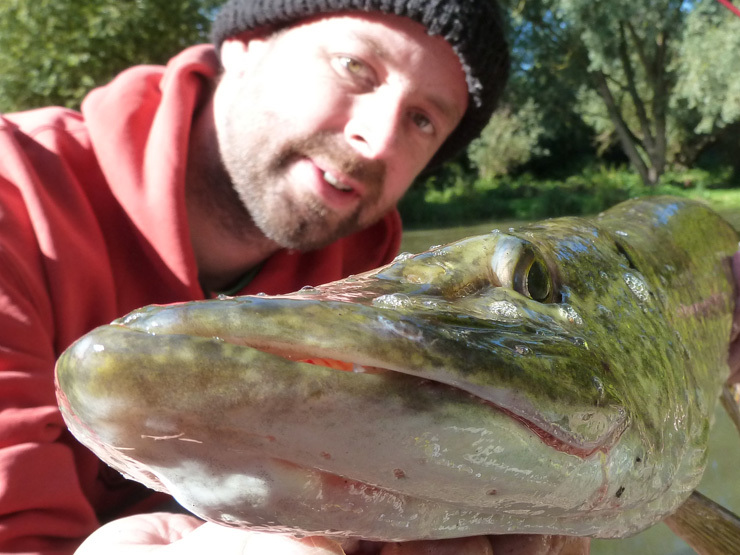 October: I had my October barbel straight away and turned my attention to getting a few pike on the scorecard. The second trip of the year to Penton Hook resulted in three pike, the best going 10lb 8oz - off and running - or so I thought! 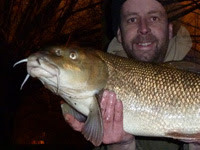 Dan and Darren continued to catch the odd barbel and Dan chipped us over our Barbel Challenge weight - 300lb - fantastic! I knew this was going to be tough, but we'd really put the time in. Another trip to Penton Hook fishing in the flood that was going to last for the rest of the season, but Dan and Darren both caught specimen bream, Dan's going a whopping 6lb 4oz. Meanwhile, in the States, Roger got his PB six foot plus shark off the beach - great stuff! November: I got my November barbel, the only one we saw all month. It dawned on me just how difficult this mini challenge was going to be - and I still had the tough December and January ones to go. Darren and I ventured to a new venue, Bury Hill, in search of a zander - I think that was to be the last time we were going to see the sun for the rest of the season. No zander but I did manage to find a couple of jack pike... And we're definitely going to venture back - in some nice weather? 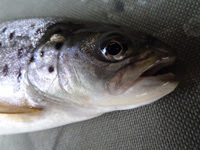 I did start my campaign for a trout, but it was cut very short when someone pointed out I was out of season - trout season is marked on my (Jack's Pike) calendar for next time. December: And then the real floods came! I think the whole country was under water, but the river I was really interested in was The Wye. I had a date with a thirty but all I could do was watch through the window as the river got ever closer. 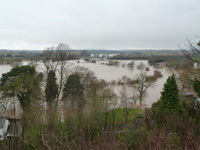 January: The floods remained. And it was cold. 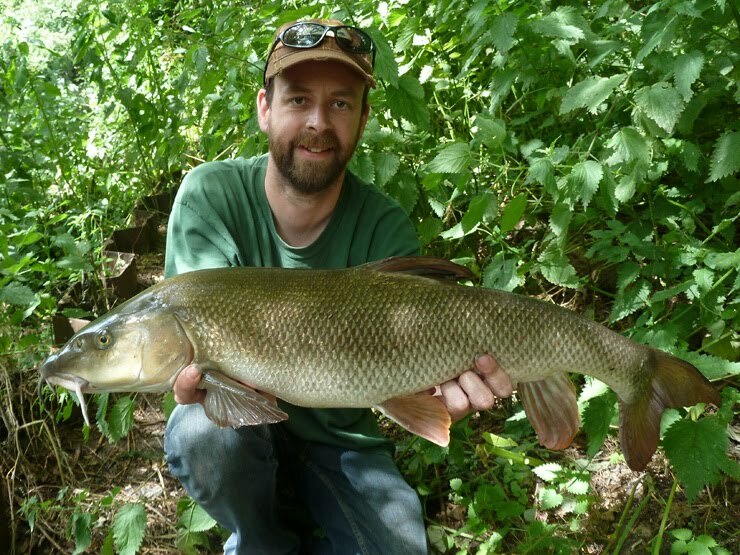 Dan managed to land a barbel on the second day of the month, hope for my challenge. And I spent every spare minute sat out in the cold waiting for that one bite... It did eventually come and I was rewarded with a new PB! Darren bucked the trend and landed 3 barbel to 6lb 14oz. But it was cold, cold fishing. February: The death of my Apple Mac resulted in having to travel into the office, two hours travel time each day - time that would be better spent fishing. 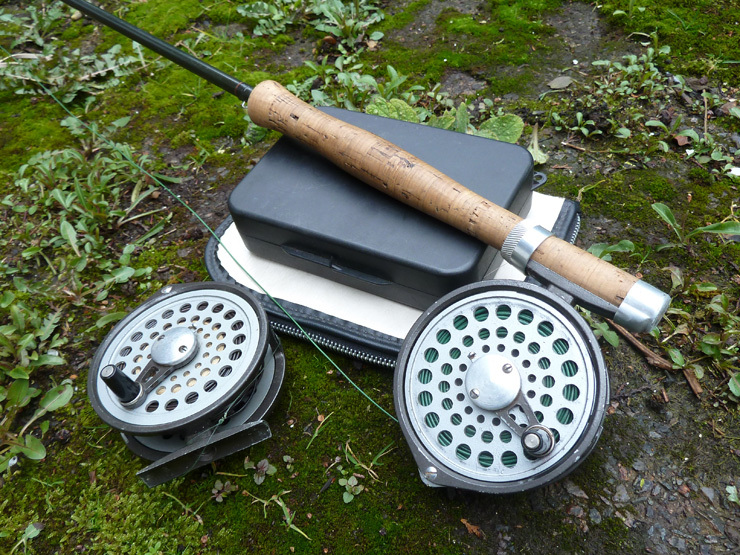 But now I was determined to get a barbel each month - I was close. And I got one, 7lb 10oz, the pressure was on March. Dan landed a PB chub of 4lb 8oz and I went on to land two cracking doubles in three days - the second of which was a new PB - delighted! 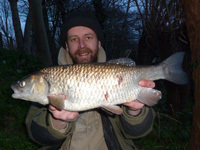 March: I cracked the mini-challenge, I landed a 6lb 14oz barbel to make it a 5lb+ barbel every calendar month of the year. Tough going but a great result. We really hoped the weather would improve and we could see out the season on a high note, but the freezing temperatures and snow flurries remained. I had my chance to end with a bang, hooking and loosing the same salmon three times in one afternoon. But the only other fish of the month was a chub on the last day - a million times better than ending on a blank. And now were back in the closed season - what am I going to do with those extra 30-40 hours a week I've been fishing? I know there are a few short-sighted campaigns to get rid of the river closed season - but I'm for it. It's not perfect; the pike breed before it and the barbel after, but the fish need a break. And remember the plants, birds and other wildlife - they need time off to flourish. And before dog-walkers and canoeists are mentioned, they move past, they're not camped out in one spot all day. A brown trout on a dry fly - never had one on the fly before (but I've only ever flyfished for chub, shad and pike). A tench from a boat - never had a pound plus tench before, and I love the idea of getting one from a boat (Bury Hill?). A garfish on match gear - caught loads, but never on the right gear (probably a 14 foot float rod and 3lb line). Right, if you're still fishing - tight lines. If you're a river angler like me it's probably time to do those house hold chores you've been putting off for the last 9 months. I'd settle for a year like that especially with the barbel. Cheers Ian. Me and Dan were looking through the photos this morning, we thought if we could see the results at the beginning of the season we wouldn't have believed it (but we'd have definitely taken it). Rogue or possible stocked. Last one I've found that was landed was in 2001. Probably the odd one under the radar since? Thanks for reply. Very persistent lower thames salmon optimist. Brilliant. What camera do you use for you pictures buddy? Use it for my fishing and nature photography, a great camera for the price. Fantastic fishing. As I have said before, he who dares wins. Time spent on the water is always time well spent regardless of results. As John Wilson said, being an all around angler will make you a better angler all around. It's a very true statement when you think about it. Cheers. Like you always say 'can't catch them sat at home'. But when I was finishing work after dark and still heading out into the cold/rain/snow I really was questioning my sanity!